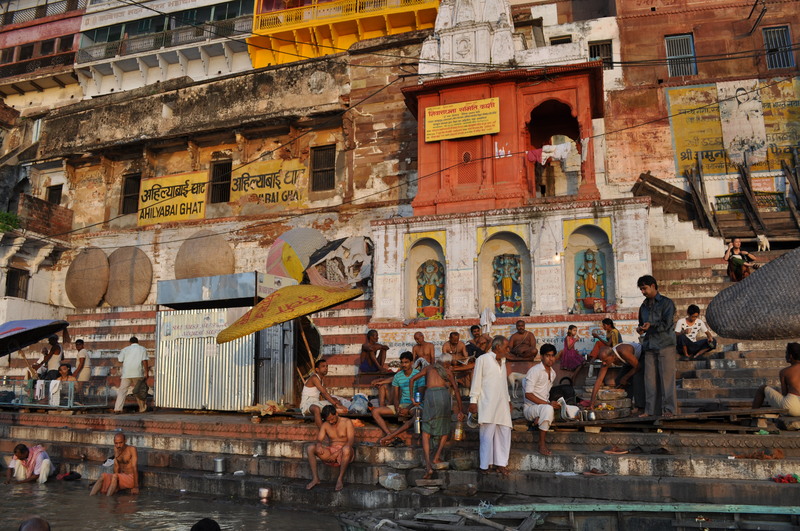 Varanasi is quintessential India. 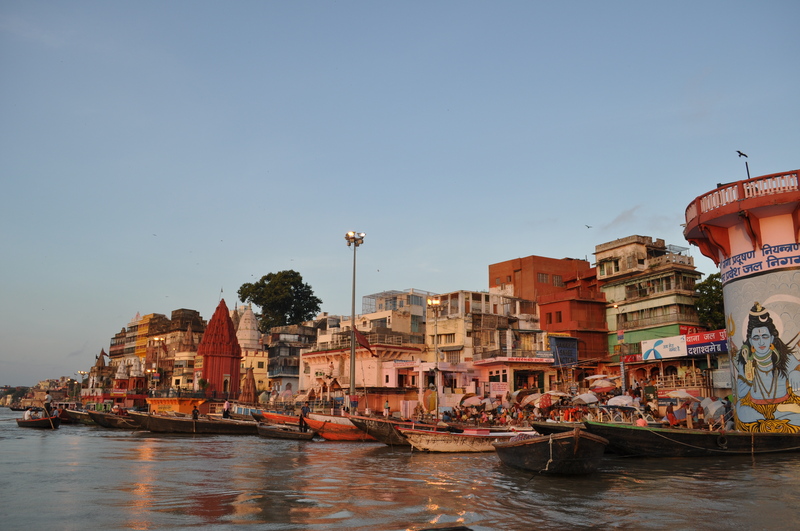 Synonymous with the Ganges river, mother Ganga. 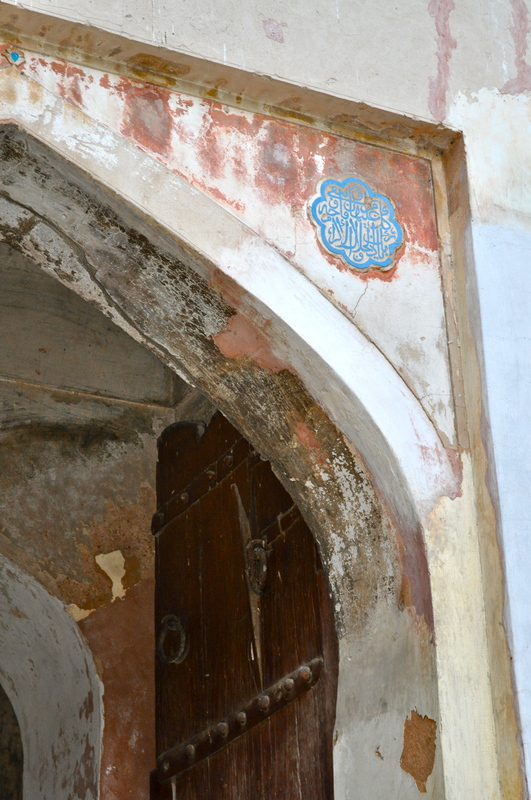 One of the oldest continuously inhabited cities in the entire world. The home of Lord Shiva. The heart of the Hindu religion. 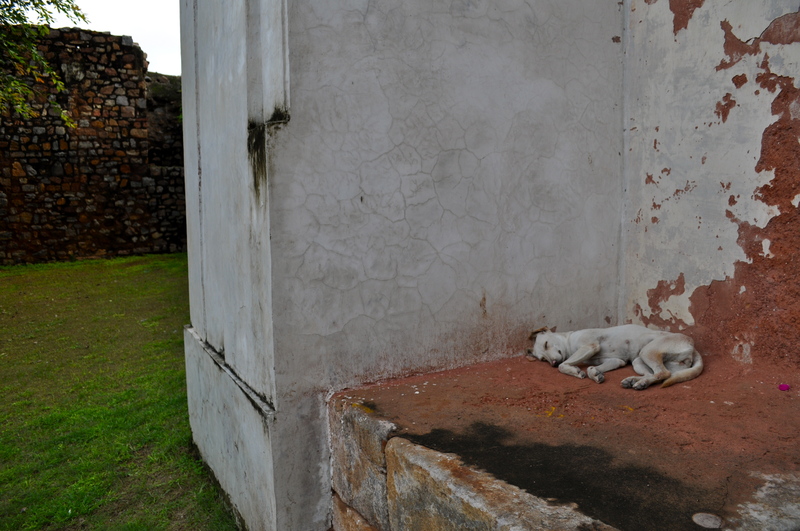 A place of life and death, simultaneously sacred and profane. It’s all terribly dramatic, and Roman and I both bought into it in our own ways. 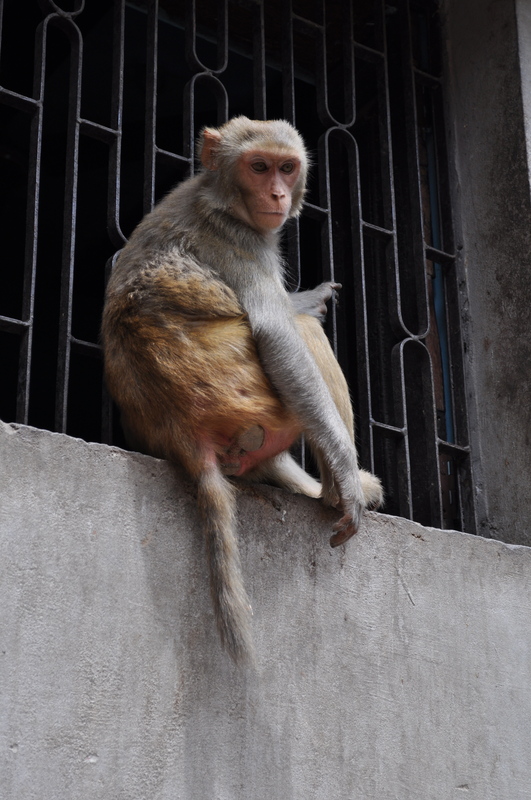 He’s been very relaxed about our India itinerary, but after everything he’d heard about Varanasi (also known as Benaras or Kashi), he was determined to see it for himself. I’d been told about the intensity of this city too, but was happy that it was on the itinerary for my group trip back in September. 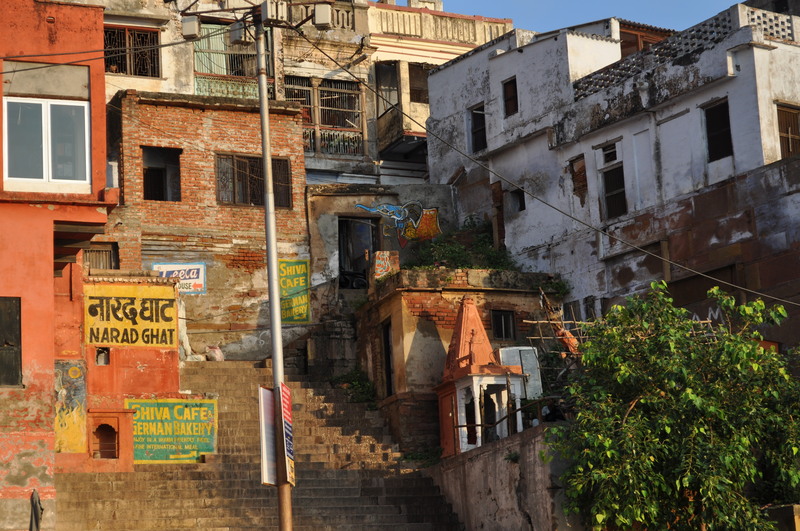 Having 48 hours we only got to sample a smattering of the city – Varanasi-light. Still, those two days were among the most theatrical, colorful and crowded of the three week journey. The sacred Buddhist site and artifacts outside the city at Sarnath. A dramatic arrival first by cycle-rickshaw through chaotic night markets and then by foot during the narrow, twisting, pitch black alleyways (there must have been a blackout that night, because the same streets did have some lighting upon my return) of the old town to arrive at Dasaswamedh Ghat all lit up by the luminous evening Hindu ceremony on the Ganges River. Up at 4:45 the next morning to witness the sun rising over the sacred waters. Going through the security check to catch a glimpse of the Golden Temple and Silver Mosque. Drinking spicy chai at silk shops from doll-sized ceramic bowls. 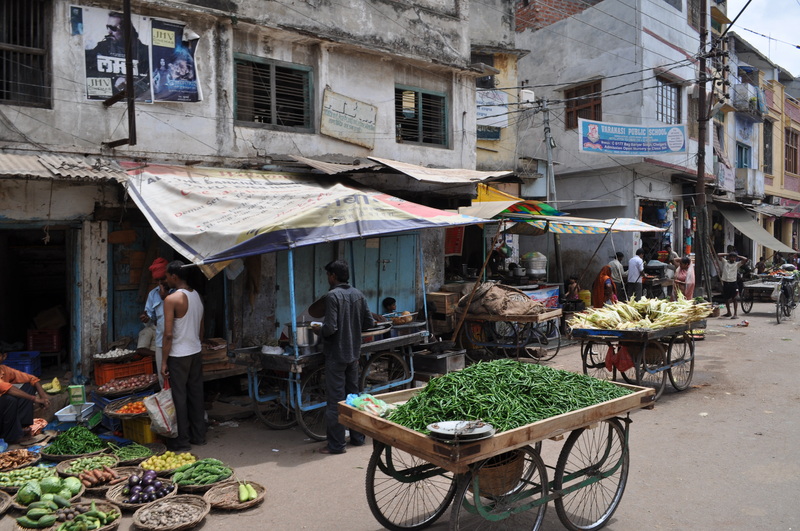 An afternoon in the company of an articulate but elusive street boy named Deepak, trying not to get lost as we walked around the sun-baked markets and shadowed old town. It was wonderful and intense and yet I admit I felt a certain relief after we left. Two days in Varanasi and I made it out without seeing anything more shocking than a dead pig floating in the Ganges during our morning boat ride. 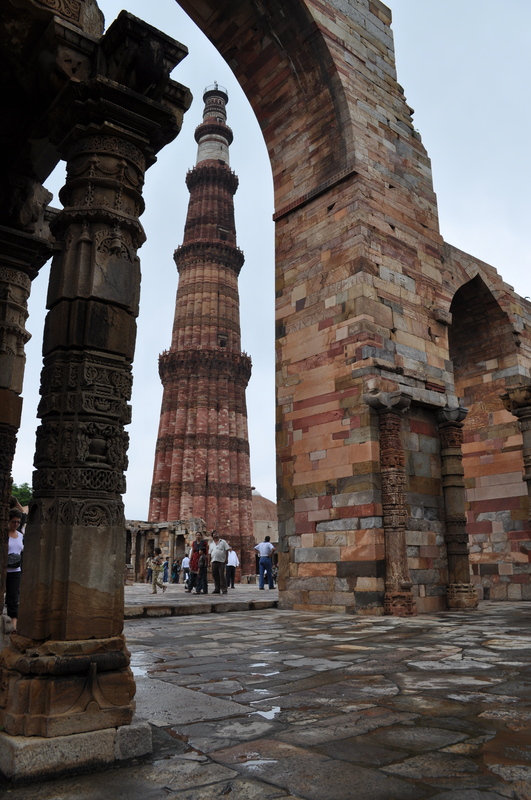 Allegedly the most moving place in India: been there, done that, and made it out unscathed and – surprised at the relief at this realization – without getting near the burning ghats. Still, I’m not sure why I felt so very nervous as Roman and I discussed and organized our trip there. Or why I felt waves of skittishness while we were there, even as I was able to take in the city’s beauty. It’s still nothing I can logically identify or understand, but gradually during our days there I was able to just accept it, and eventually relax more and more. There was lots I loved – the peaceful view of the ghats and river from high atop the Dolphin Restaurant, the squishy coziness of the Brown Bread Bakery (with awesome bread and the best coffee in town, it became our morning ritual. Especially sweet was the little mouse that lived in and among the cushions), and especially the vibrant, colorful life in the labyrinth that is the old town. But the burning ghats, sites of 24-hour a day cremation and funeral rituals, made my spirit squirm. Conceptually I have no issue with it – I appreciate the beauty and importance of the ritual and I am as at peace with the concept of death as the average person. I didn’t feel massively uncomfortable with seeing the funeral pyres and being passed in the streets by the processions bearing the bodies to the river didn’t faze me at all. But at each visit to the location of the burning ghats, this instinct rose in me after a few minutes: I wanna get out of here now please!! 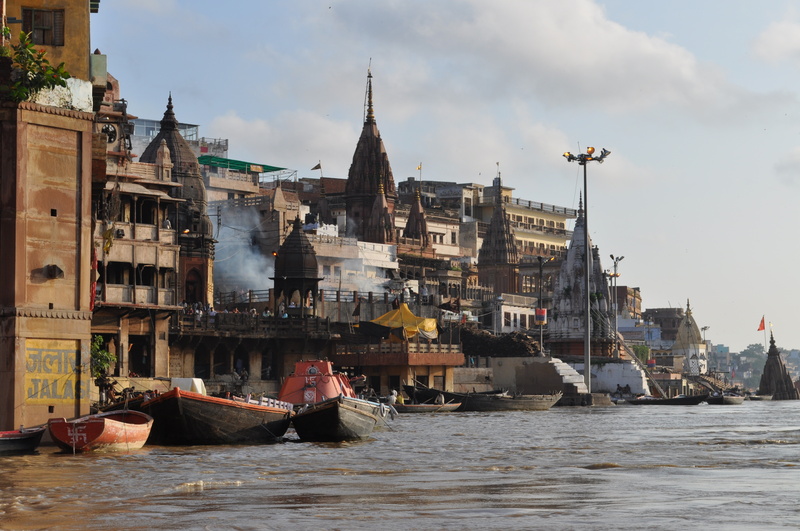 While I don’t understand what this was about, what I can say after my second visit to Varanasi is: been there, done that, spent a lot more time at the burning ghats than I thought I could handle – and made it out unscathed. In fact, I even found more to love about the city than during my first visit. We just happened to arrive in perfect timing for the spectacular Hindu festival Dev Deepavali. This link can tell you more about the religious significance than I can, but what I can say is that it was simply magical. Roman played hardball and negotiated a fantastic price with a boatman so we were able to watch all the action from the Ganges. We pushed off from shore just before sunset and watched the riverside come alive with music, ceremonies, parties and lights. The ghats were packed with an incomprehensible number of people. Nearly every ghat on the riverside was alight with thousands upon thousands of small oil lamps. A small stream of paper lanterns were drifting in the sky above the water and everyone was reflecting the lights on the ghats by setting small leaf bowls filled with marigolds and a lit oil candle to float on the water of the Ganges as an offering. Everything was warmth and beauty and a million points of shimmering lights. An absolutely incredible sight to see. Especially striking to me was the wave of heat and smell of the oil from the lamps when we walked up the ghats after our boat ride and the fact that the biggest party of all – massive speakers blasting incredibly loud, joyful bhangra music and a ghat throbbing with a dancing crowd – was right next to one of the burning ghats. During my first visit, we stayed in a nice hotel outside the city center and away from the action. This time, Roman and I were in the midst of the old town, the tangle of streets too narrow for any vehicle bigger than bikes or hand drawn carts. I’m pleased to say that even Roman got lost in these streets, and we had a great time wandering around, trying to find our way and discovering unexpected nooks and crannies along the way. I loved these explorations so much. There is so much life going on in those narrow streets, so much to see. And still there were unexpected moments of stillness and peace too. Finding an ancient tree growing out of a decrepit rooftop, a shaft of sunshine managing to find a way to pierce the shadowed alleys, walking and chatting with a schoolgirl through quiet lane. 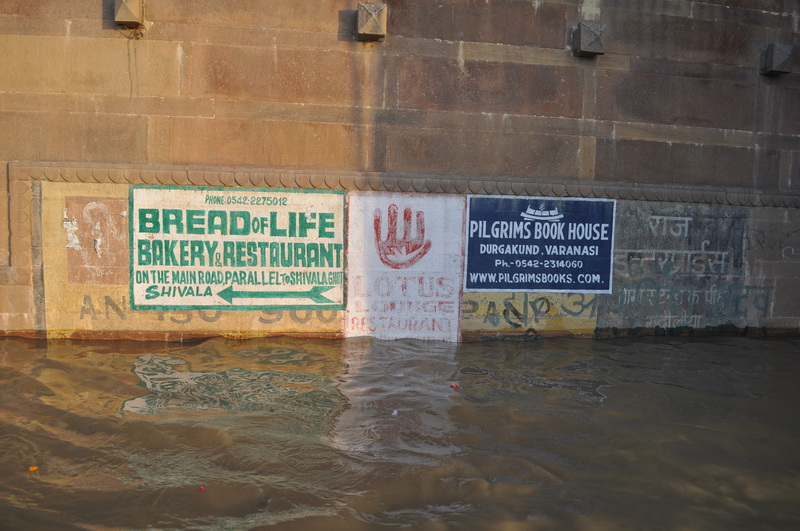 Varanasi seemed to be full of philosophers and of people looking out for us. Folks were so eager to share the history and meaning behind the traditions. We had many willing teachers on the topic of the burning ghats. “Cremation is education; burning is learning” is something we heard over and over again. So many of the Indians we met there warned us that there were plenty of unsavory characters in Varanasi; that we had to keep our guard up. But any time we looked the slightest bit lost, people would approach us to give directions. 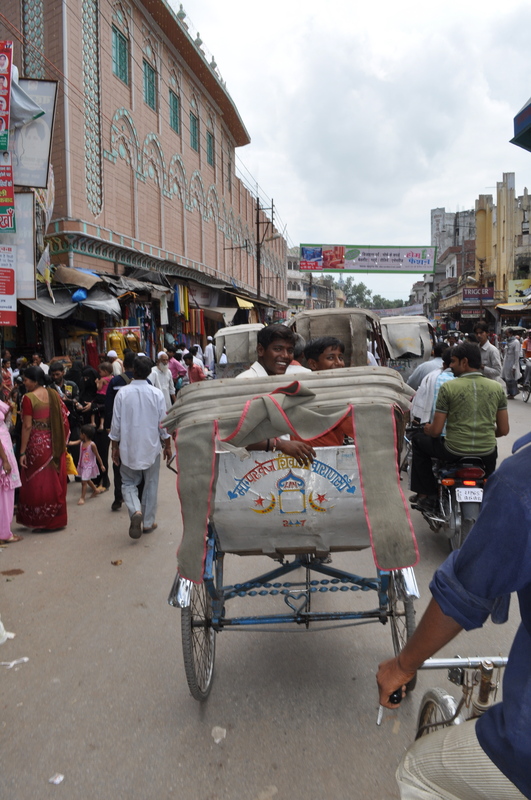 When cows blocked our path in the narrow streets, folks would come to help get them moving. People were happy to help and I found support and company even as I was feeling nervous at the burning ghats. I had gone there with Roman but didn’t feel comfortable staying as long as he wanted to. A lovely, chilled out young guy named Deepu kept me company just outside the burning ghats while Roman took in the sights. He told me lots about the funeral ceremony and Varanasi in general, and about his German girlfriend and his dreams to move to Jamaica and we laughed and smiled together in the sunlight and were eventually joined by some lovely old men who were there to bathe and who enthusiastically explained the ceremony to me all over again. After they all left, a tough little boy about ten years old came up to me and let me fly his kite while spitting out streams of brown chewing tobacco juice and getting into scrapes with his friends and other kids on the ghats. It was so sweet to receive all that unconditional company and it really did me good. As challenging as it was for me to be at the cremation ghats, I was still in awe of all the life that happened directly in the face of the ceremonies of death. 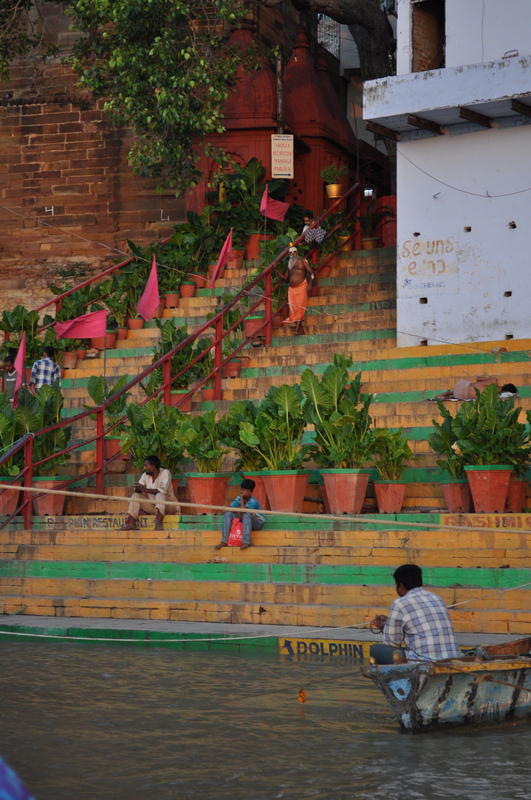 Just next of the ghats, people carried on the business of living in earnest. Pilgrims bathed. Children played. Laundry was washed. Food was prepared, sold, eaten. Widows with their shaved heads moved through the old town’s alleyways, gossiping and shopping with apparent relish. Even directly at the ghats, mourners were talking on cell phones, people were playing cards, cows and dogs were wandering among the pyres on the constant lookout for food. I am sure there must have been people there who were sad for their departed loved ones, but we sure didn’t see them. There was one funeral procession we happened upon that was preceded by musicians playing celebratory music. Roman had been told when the departed person is past a certain age, the funeral becomes a happy celebration for a long life, well lived. Seems like a great idea to me. After four days in Mcleod Ganj, we flew to the southern state of Kerela, where we visited multiple destinations. Our first stop was Cochin, where it was amazing to see the huge Christian presence; there were churches everywhere and pharmacies and banks were often included something Christian sounding in the name. At the oldest European church in India, St. Francis. Portuguese explorer Vasco Da Gama used to be buried here. Outside the Cochin Jewish Synagogue. Unfortunately we couldn’t go in, as it is closed on Fridays. The next stop on the Kerala tour was Kumarakom, where we stayed at the most amazing hotel of the whole trip: the eco-resort Coconut Lagoon (http://www.cghearth.com/coconut_lagoon/index.htm). Accessible only by boat, focused on sustainability, local tradition, serenity and quality, this place was just amazing! Upon arrival, we were all handed coconuts with straws in them. After drinking the refreshing water, we could have them cracked open at the coconut hut so we could eat the meat inside. Kingfisher (the bird, not the beer 😉 ) hanging out by the butterfly garden. The food on offer was just great. My lunch: vegetable thali. As cool as everything about this place was, my personal favorite thing was the outdoor bathroom. 🙂 Too cool! View from our dining room at the front of the boat. View from the upstairs lounge. Our final stop in Kerala was Kovalam. We stayed at a massive hotel on a hill overlooking the Indian ocean. 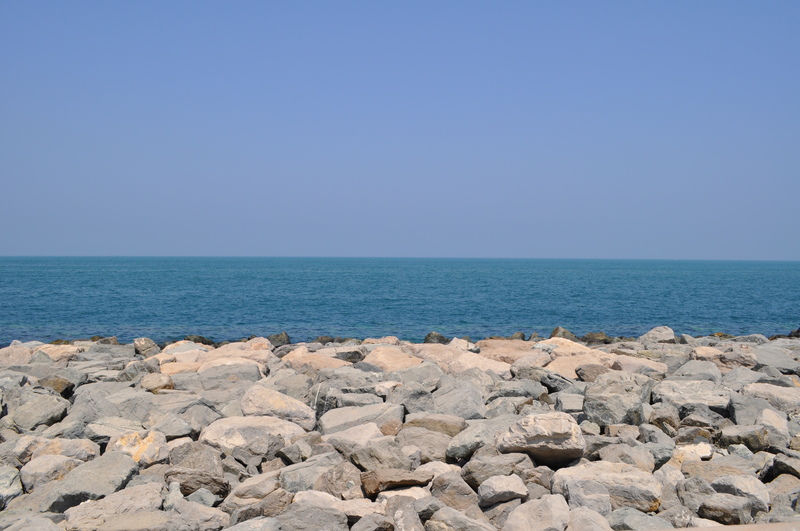 The beach was beautiful but the waves were massive and wild – nothing for a weak swimmer like me. Happily, the place had a beautiful pool, an ayurvedic spa, a fantastic restaurant, and my longed for Pina Coladas – I was a happy camper (and too busy lounging to take too many pictures ;-))! Statue of Ganesh in the lobby. Apparently there is an increasing effort to deal more responsibly with trash and the environment in the area. Nevertheless, there is a lot of trash in the area. Opinions from travelers I have spoken with vary as to whether the amount of pollution has increased or decreased in recent years; it seems it depends on when they were last here. Thumbs Up Cola – tastes a bit like Moxie apparently. Taste the thunder! This is Deepak number two. I’m pretty sure I was hustled by the guy. He told me this story about how he repaired shoes and could sew clothes and that he really needed work but he didn’t want to be paid in money – he just needed food. HIs dad was a drunk and so was his boss and they would just take any money from him and he was the only one looking after his two little sisters and they and he were just hungry. I knew my friend had a hole in her skirt that needed mending so I I brought it to him to do, and even got someone else in the group to give him some work. 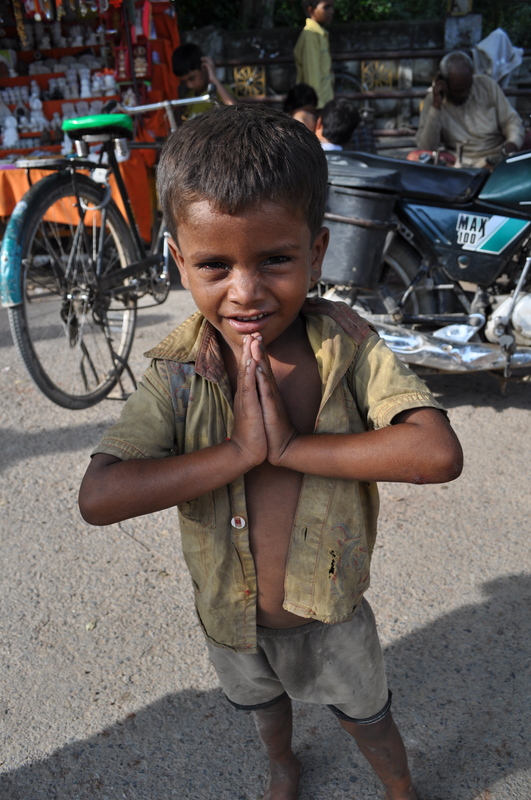 I told him let’s go shopping, expecting to by a few hundred Rupees worth of food and to make his day. He walked me straight to a local shop and without blinking an eye started pulling massive bags of rice and flour and containers of oil and ghee off the shelves, speaking to the shop owner in a local dialect the whole time. I started to get a funny feeling but felt too polite and unsure to say anything. Finally the shop keeper told me the total – nearly R4,000 – way more than I had spent on anything during the whole trip and this was for basic food staples, and a heck of a lot more than I had intended to spend on food to pay for a skirt being mended! At this point I was pretty sure I was being scammed but still, the instinctive need to be polite persisted – I told them I only had a certain amount on me – still way too much money to spend on a skirt but a good deal less than R4,000, and that was all I could pay for. Mcleod Ganj at night. This photo doesn’t do it justice though – many more stars in real life! Eight-legged visitor perched conveniently above Heather’s open suit case! Blarg! It looks small in this picture but that is due to the flash distorting the perspective. Do not be fooled, this spider was seriously large and nothing to mess with! Cousin to the other big, eight-legged friend that visited Roman and me in Apex hotel during my second visit to Mcleod Ganj. From Amritsar, we drove north. It was fantastic to see the landscape change over the hours as we moved into the foothills of the Himalayas. Our next destination was Mcleod Ganj, seat of the exiled Tibetan government and Dalai Lama. More pictures from the group trip. 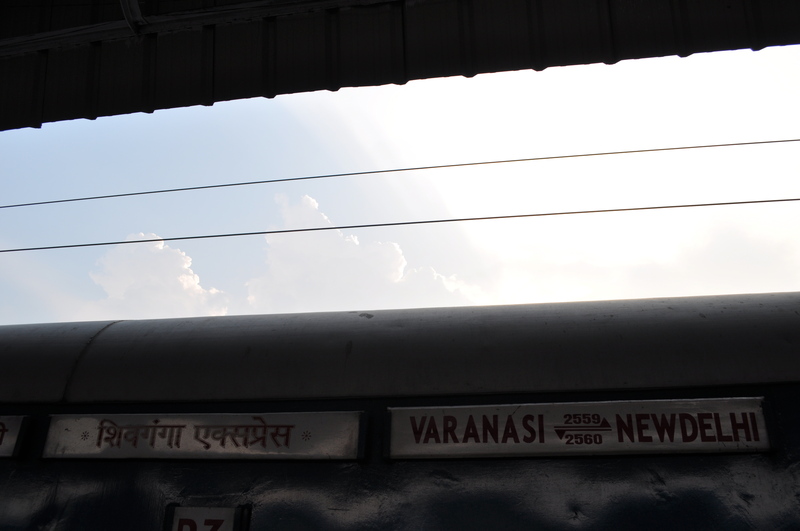 After Varanasi we took a train to Agra. 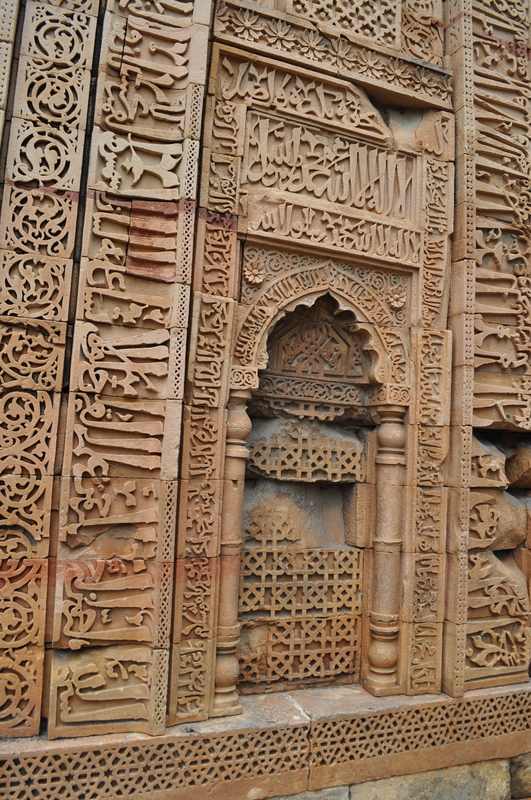 Of course I had seen photos of the Taj Mahal plenty of times before but nothing had prepared me for its splendor. It is so much more grand, ethereal and simply beautiful than I had ever expected. Worth seeing for yourself! 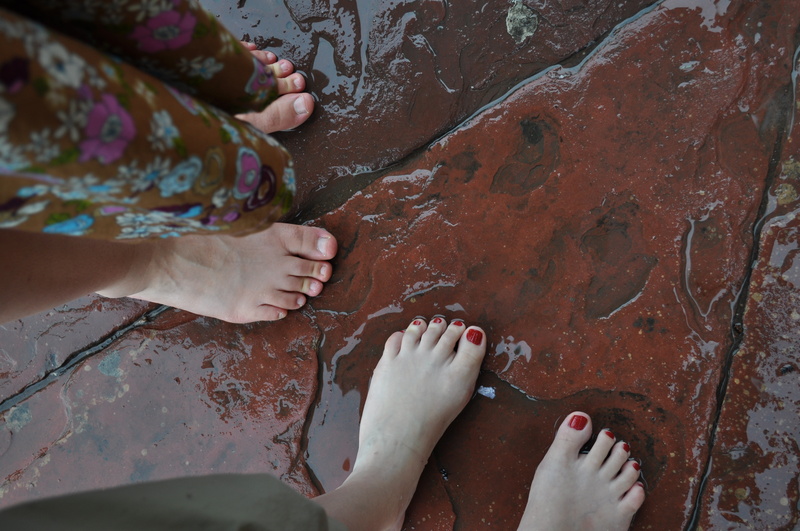 The funny booties you have to wear over your shoes to walk around the Taj. It’s that or burn your feet on the sun-baked rock. 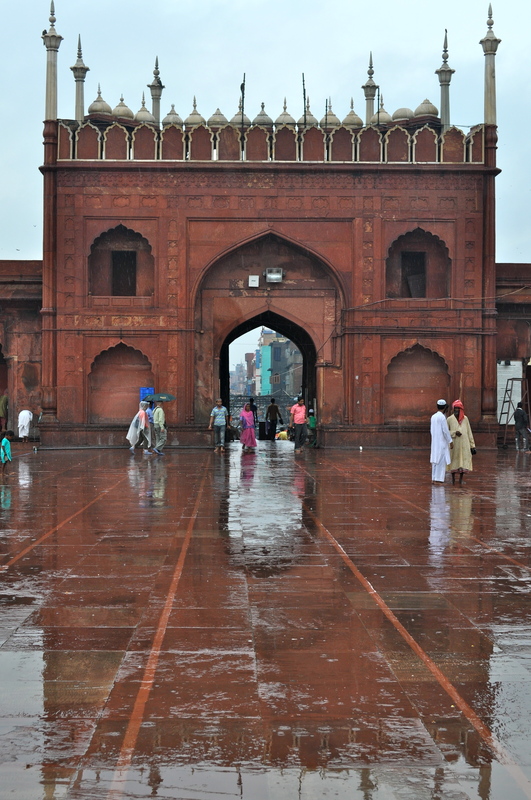 After the Taj Mahal, we went to the Red Fort. We had one full day in Amritsar. Our first stop in the morning was the Golden Temple, heart of the Sikh religion. The 24 hour kitchen serves thousands of people each day. Steaming, massive pots of dal cooking in the background. I made a pit stop on the way to India to see a friend in Dubai. 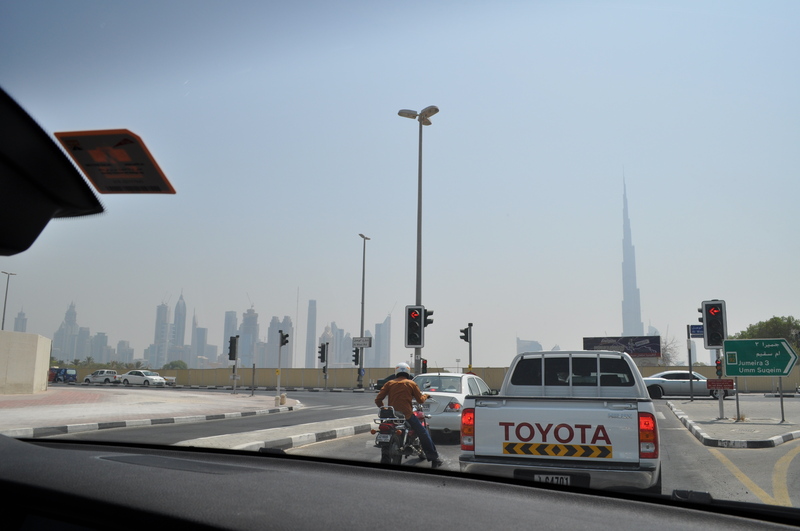 View of the Dubai skyline from the car. The Burj Khalifa - the world's tallest building - is mind boggling as it dwarfs everything around it. 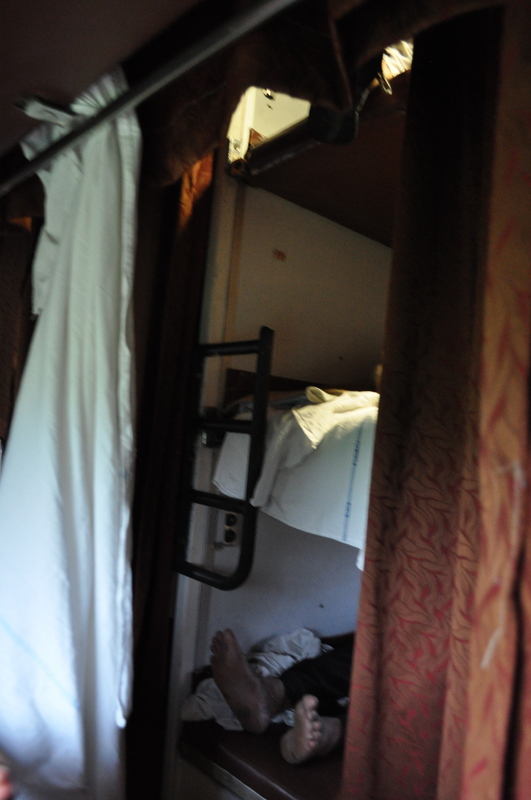 Night train to Varanasi was a total adventure! 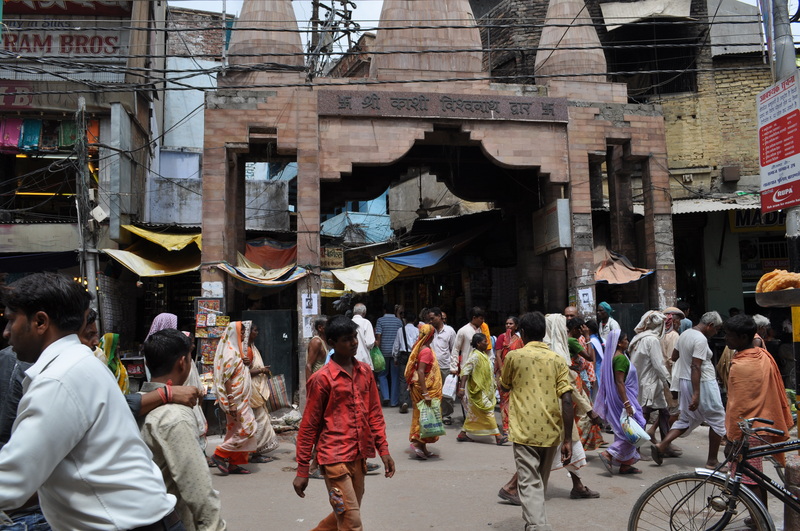 Varanasi was hot, chaotic, mystical. 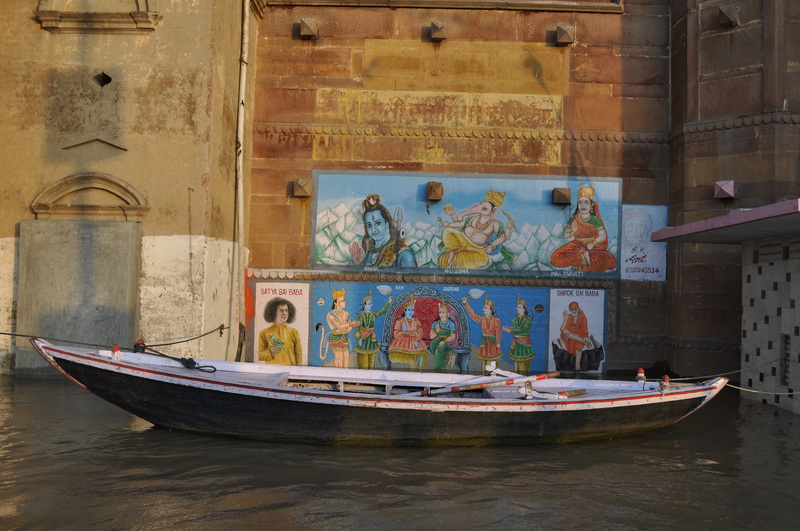 Our first sight of the Ganges was at night, from a boat, watching a Hindi ceremony. We came back the next day for a view at dawn. 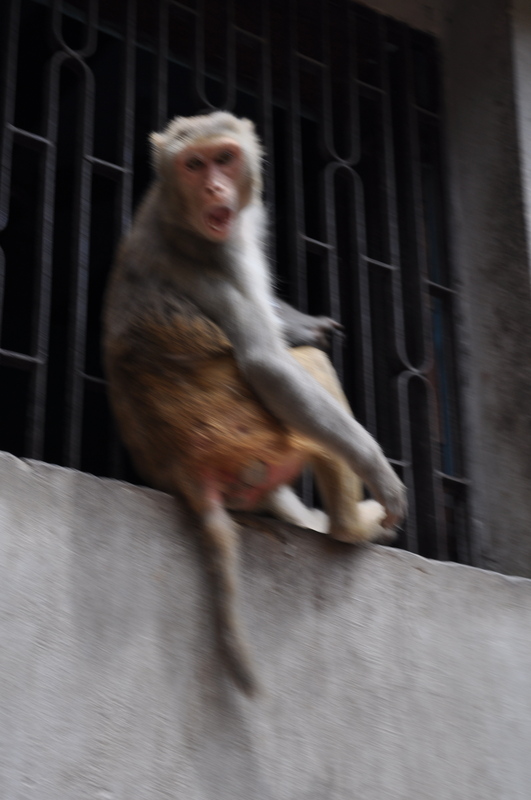 It’s three weeks now that I have been in India. So much has transpired, it is hard to know where to start. As I need to start somewhere though, I think the right place to begin is with thanks. Before I say anything about India, I want to say thank you to all the people at home (in Switzerland and the States) who are so supportive of what Roman and I are doing. I have a small picture book of friends and family with me that I have been setting on my hotel bedside tables and it has been like stocking up on love and good vibes every time I look at the smiling faces within. I feel so lucky to have such wonderful people in my life. Special thanks to my sister, who has encouraged me more than anyone, and extra special thanks to my parents, who love and support me even when I am doing something that is outside of their comfort zone. And a huge, huge thank you as well to Roman, who did the heavy lifting to finish things in Switzerland while I was getting my first glimpses of India. You are my hero! Having heard so many contradictory stories and opinions about India, I arrived not knowing what to expect but also a bit braced. Braced for things to be difficult, frustrating or shocking. Braced for the discomfort of getting sick. Braced for things being too much: too hot, too sweaty, too dirty, too loud, too spicy, too depressing, too uncomfortable. 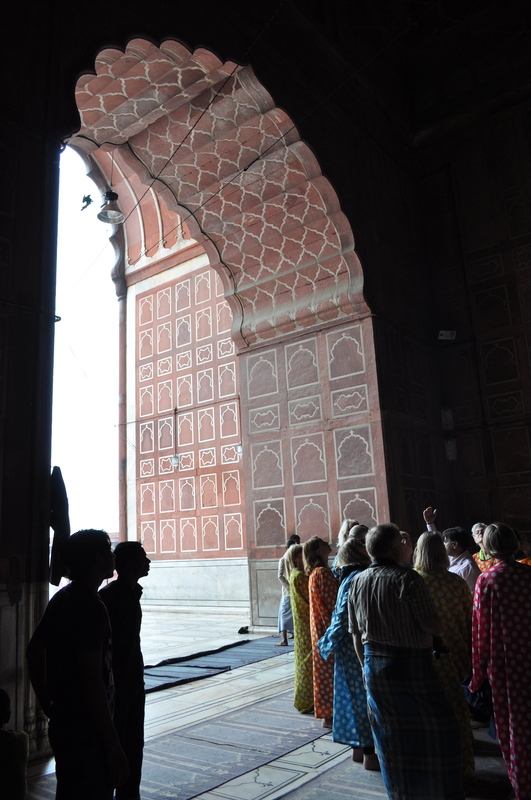 However, three weeks in, none of that has been my experience, and I have to express gratitude for having had such a gentle and graceful introduction to India. Traveling with a big, organized group, I know I have been sheltered and supported in many ways, and I have to say huge thanks as well to Juelle and Donovan, who created a superb trip and who amazed me with their consistently upbeat energy, no matter what was going on for the group. And it was fantastic to travel with such an open, caring, fun bunch of people, and especially with my spiritual family of Indi, Heather and Kevin. On top of the goup trip’s wonderful infrastructure, I think it probably helped for me to come in expectationless. 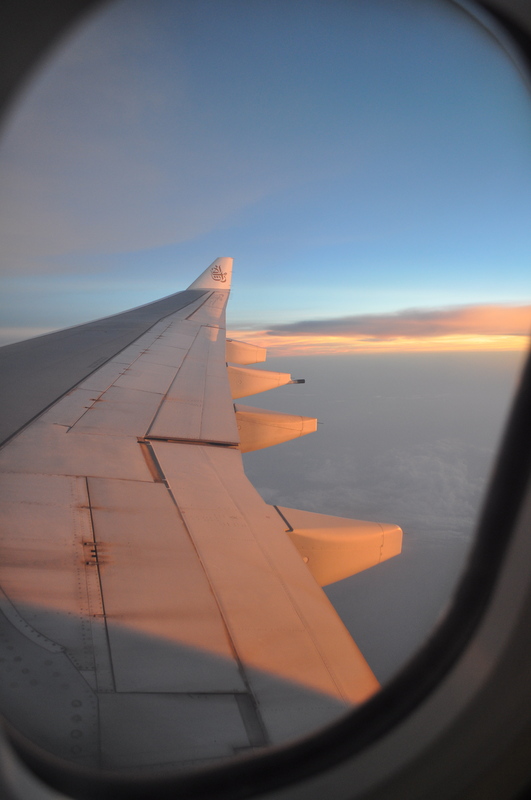 I seem to have been able to switch into some sort of travel mentality right away and could be delighted or at the very least interested with pretty much everything that was in front of me. And there was so much to be delighted by.